A marriage is the foundation of the family and it represents the relationship between Christ and His Church. If we can grasp God’s intent of the marital relationship, then we should be able to start to grasp the depth of God’s love for us. Don’t miss the significance of this or take it for granted. Hi Sebastian, what I did for many years and some others do too, is not realise that is it is not fleshy worldly love that keeps a marriage together or alive, it is God’s Love, as we ask, we receive and are also strengthened and bound together by three cords that cannot be broken, which is The Lord and both husband and wife but one can’t do it alone it takes three, but by prayer, perseverance and patience, and God’s words of Truth in our conversations and shown in our actions, we can encourage even our unbelieving or unforgiving spouse to seek The Lord but we can’t make them, nor does God go against their free will. You are so right Anne! Thank you for that!!!! Sebastian you pointed to the depth of Gods love for us, and its important for us to remember that, as in marriage, love is important as a basis for the relationship. So too is that love to be the basis of the relationship we have with our God , he wants to love us so much , how much are we prepared to give in return.? Well said Ron! Blessings my friend! Amen! Thank you for sharing this message. God bless ! You’re welcome, may God’s best be yours! Thanks so much again!! The Lord bless you and your ministry!! Thank you for that! You’re right…our real covenant is with God. 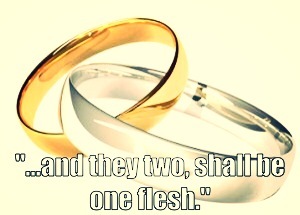 We should do our part in the marriage, He will fulfill His portion. Amen! I have always appreciated the fact that the LORD is “jealous” for us. I see that as a positive. He loves us so much that He desires us to give all our love and affection back to Him. When we do that, we are immeasurably blessed. Thank you Sebastian! You’re welcome Toni! That is such a great expression of the reciprocal relationship God’s desires to have with us. Thank you for this! Blessings to you and yours!